UAVaid were delighted to give a guest lecture to the Royal Aeronautical Society in London, on 16th February 2017, on the subject of UAV’s in Humanitarian Aid and Development. 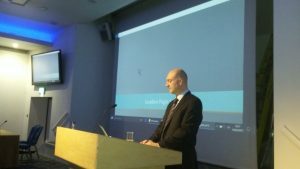 Talking to a mixed audience at the RAeS headquarters in Hamilton Place, in London’s Mayfair, UAVaid co-founder Daniel Ronen presented an overview of UAV technology in humanitarian and development contexts, and introduced the UAVaid platform. He outlined the potential applications and how UAV’s, as a frontier technology, can provide a major increase in both capacity and capability for humanitarian actors in numerous applications. Daniel Ronen presents to the Royal Aeronautical Society. The session was well received and Daniel was kindly presented with a token of the Society’s appreciation by Charles Clarke C.Eng, on behalf of the RAeS.